WELLDONE PUBLISHERS TRENDS· Art Prints & Greeting Cards Worldwide. : The Fashion and Art Weekend: When Fashion meets "The Memphis Group"
The Fashion and Art Weekend: When Fashion meets "The Memphis Group"
Welcome to a NEW article of The Fashion and Art Weekend, directed and written in exclusivity for Welldone Publishers: Art Prints & Greeting Cards Worldwide by Silvia Moya @Betrendy, an expert fashion blogger. 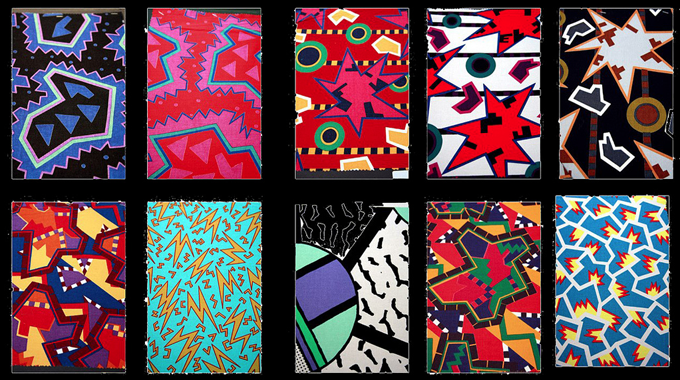 The Memphis Group was a cultural phenomenon that revolutionized the design world in the 80's. 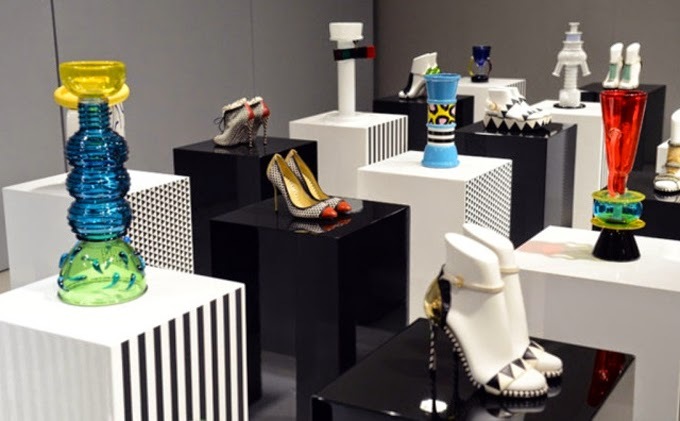 It was founded in 1981 in Milan by the Italian architect Ettore Sottsass next to other young designers and Milanese architects. 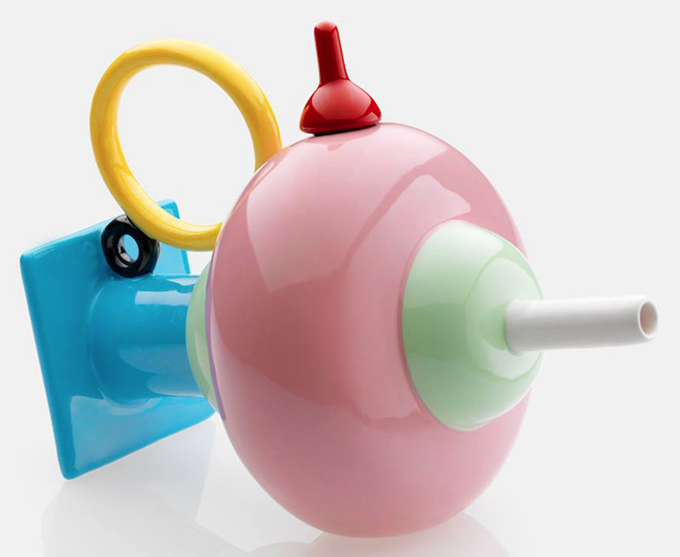 In a short period of time, loads of international names from the world of design joined the group: Michele de Lucchi, Matteo Thun, Xavier Mariscal, Marco Zanini, Aldo Cibic, Andrea Branzi, Barbara Radice, Martine Bedin, George J. Sowden and Nathalie du Pasquier. The main purpose of this creative movement was to shake up the traditional, conservative and minimalist mind that was succeeding in the design, especially in the furniture. 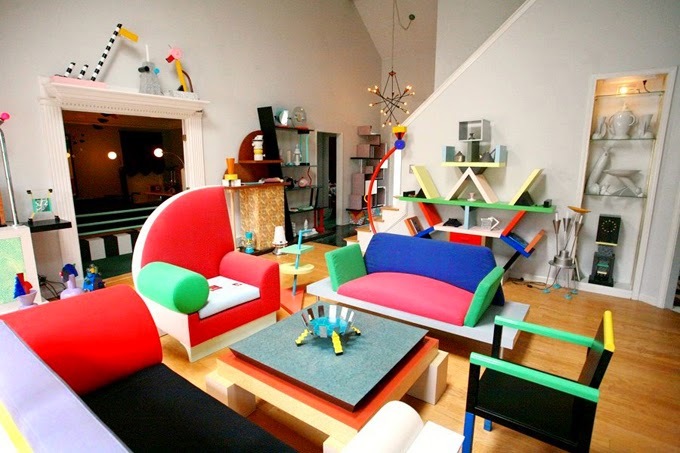 The Memphis Group was surrounded by the influence of the modernism, the pop culture, the art deco, the kitsch style, the vibrant colors, the mixture of different prints, fabrics, materials and colors in divergence with the Post-Bauhaus's rational aesthetic of the 70's. Is interesting to note that the group's name was inspired by Bob Dylan's song: Stuck Inside of Mobile with the Memphis Blues Again. 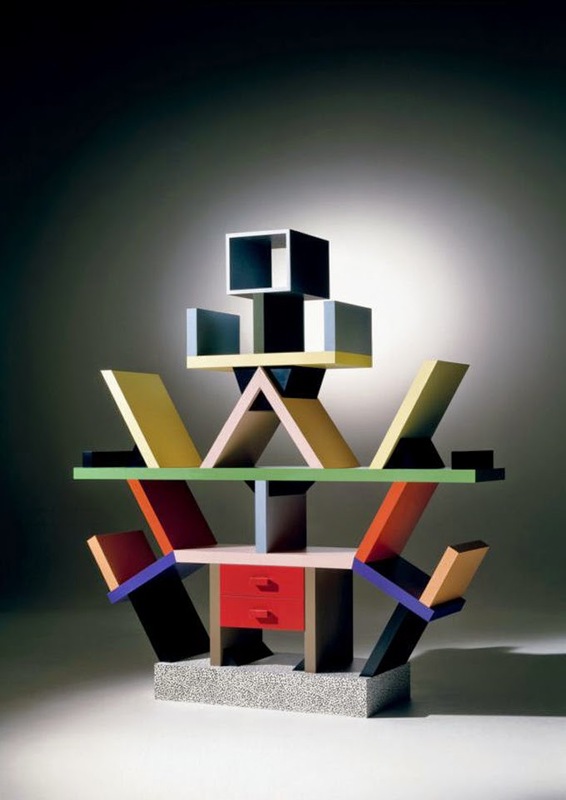 The anecdote comes up because when Sottsass met the team at the first time the theme was playing at his office. 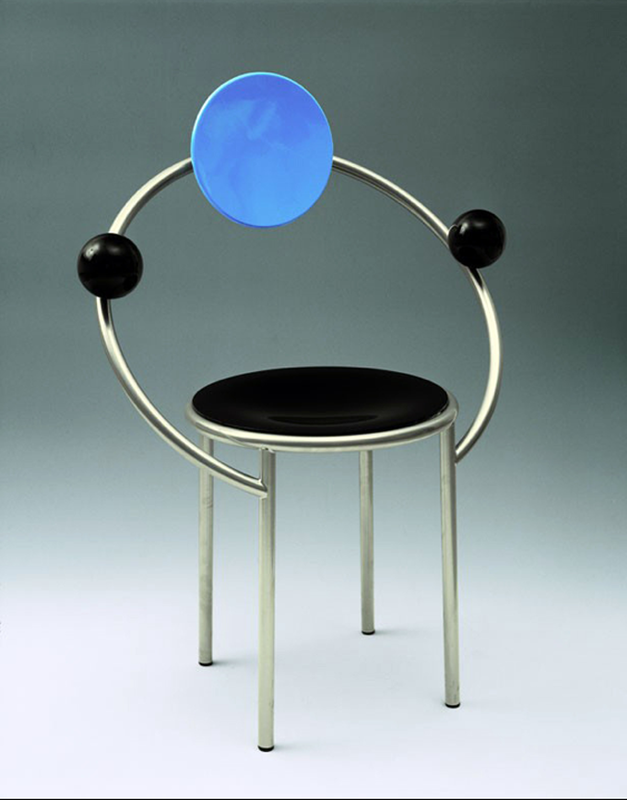 The Memphis Group was dissolved 8 years later although their power and influence remains today. 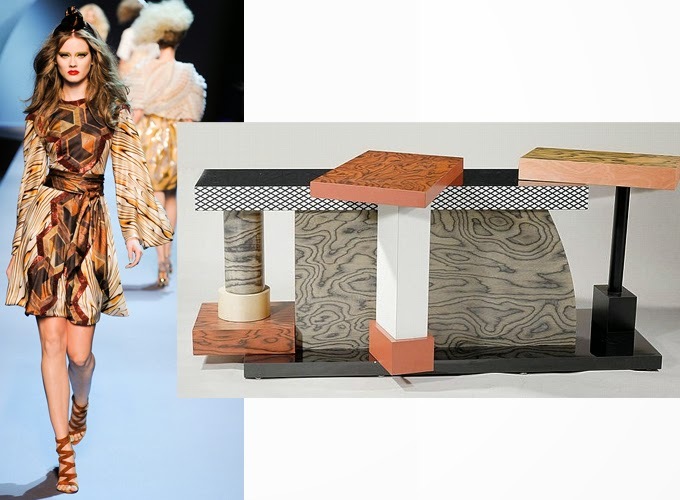 Their heritage based on colorful decoration, asymmetrical shapes or plastic laminate could not stop fashion to get some inspiration, specially during the recent years in which the 80's fashion revival has become stronger than ever. 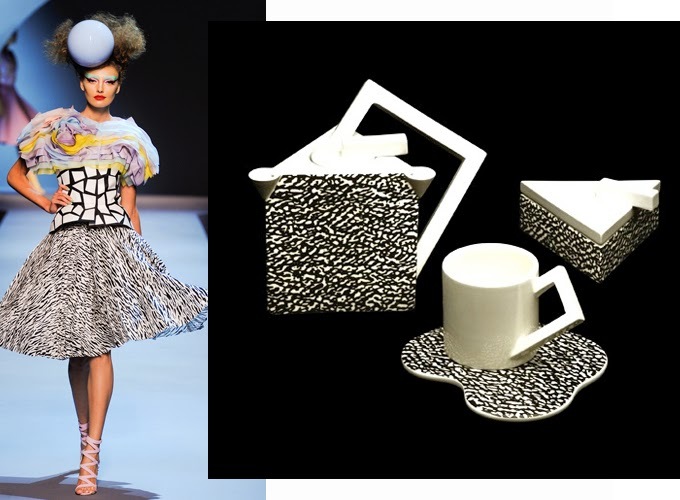 One example of the influence of The Memphis Group on fashion it comes from the house of Dior. 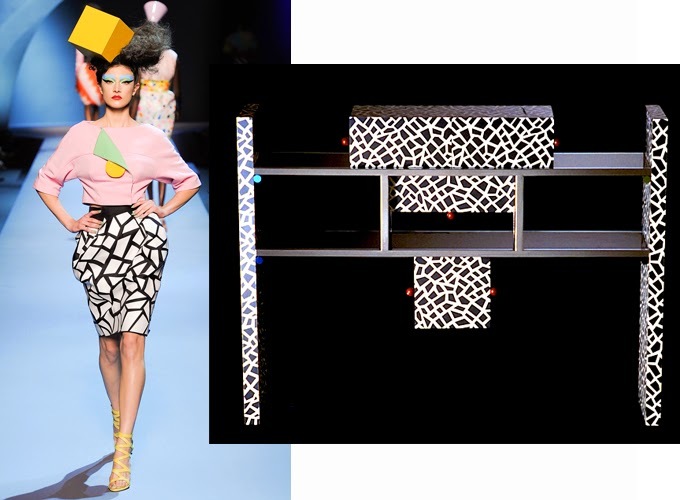 The first post-Galliano's Haute Couture collection (Autumn-Winter 2011) not only paid tribute to the iconic French Maison's silhouettes but also to the peculiar way The Memphis group used to combine geometries, colors or materials. The results were a bizarre, eccentric and excessive collection: architectural forms, volumes, mixing color block, the bacteriological pattern... the new Dior definitely stressed the Memphis aesthetics. 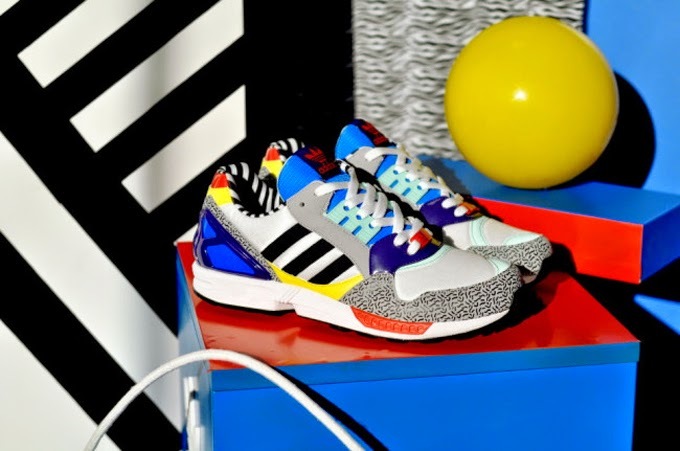 And talking about shoes, we have to mention now Adidas.The German retailer made tribute to The Memphis Group's colorway designing a pair of trainers in 1989. Although the most stunning collection that pays tribute to the whole Memphis movement it was launched by the Italian women's footwear company Sergio Rossi, in 2013. 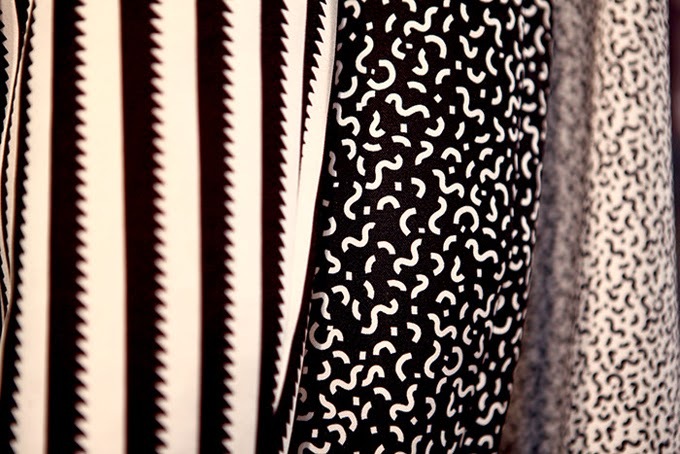 The Italian brand inspired all its Spring-Summer Collection by the bold graphics of the Memphis collective. 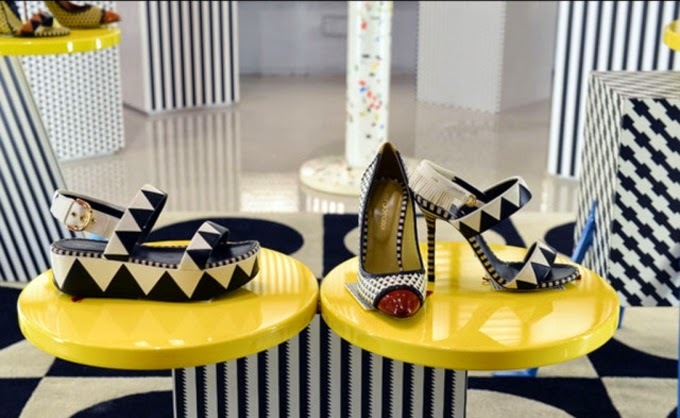 The Zaaga Zig platform sandals were the hotspot of the collection and they were exhibited in the confines of 10 Corso Como, held in Milano, sharing room with original Memphis pieces. 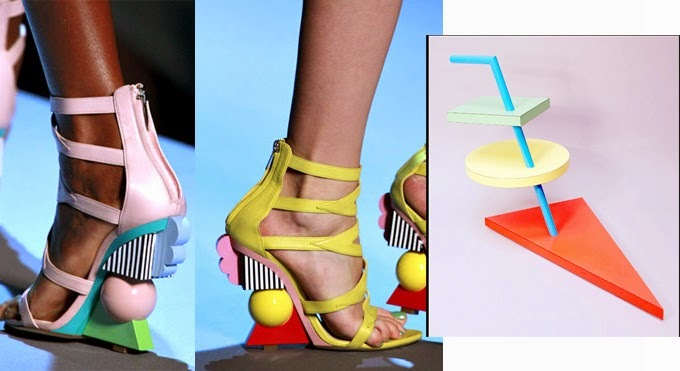 "The technique used by Memphis, including the combination of prints, vibrant colors and unusual materials to create the most innovative mixtures, gave me the opportunity to extol the handcrafted Sergio Rossi's flair and to make them feel like beautiful design pieces" the Creative Director of the footwear brand, Francesco Russo, has said. 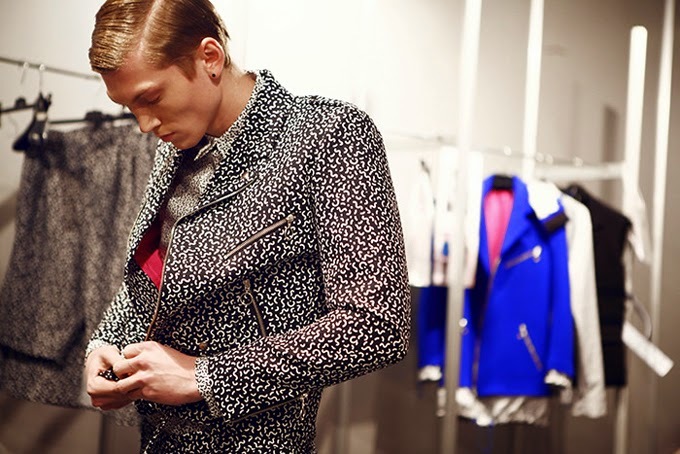 "Influence peddling", the Spanish designer David Delfin has described his Autumn-Winter 2014 collection's motto. For David Delfin, the isolation doesn't exist in Art but the updating of the existing concepts. The architectural "memphinian" shape doesn't attract the Spanish designer, but the bacterial or saw patterns and the pop aesthetics that closely resemble the fun, different, unexpected and functional philosophy of his brand. 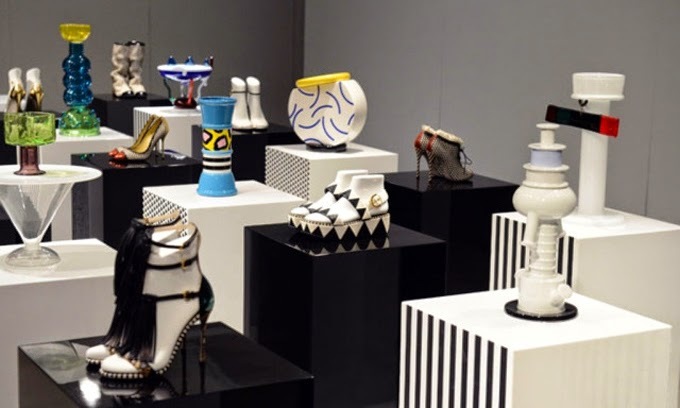 In 2006 Miuccia Prada shown interest for the iconic illustrations that the French-born, Milan-based artist Nathalie du Pasquier drawn in the 1980's as an original member of The Memphis Group. 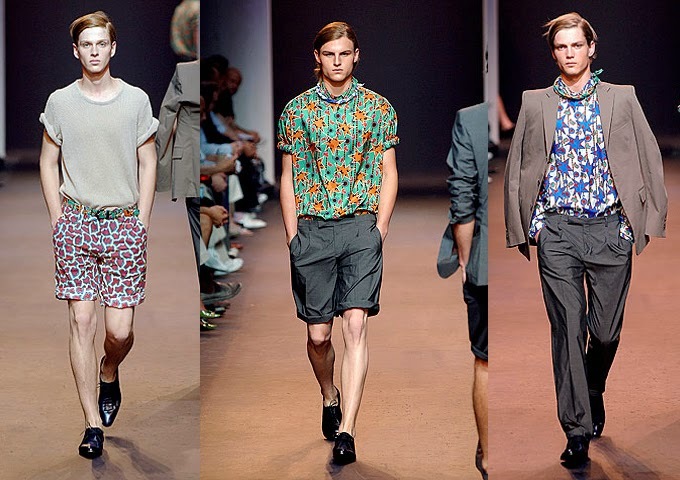 The Italian luxury brand brought the powerful look of Memphis to the Men runway designing the Summer line. 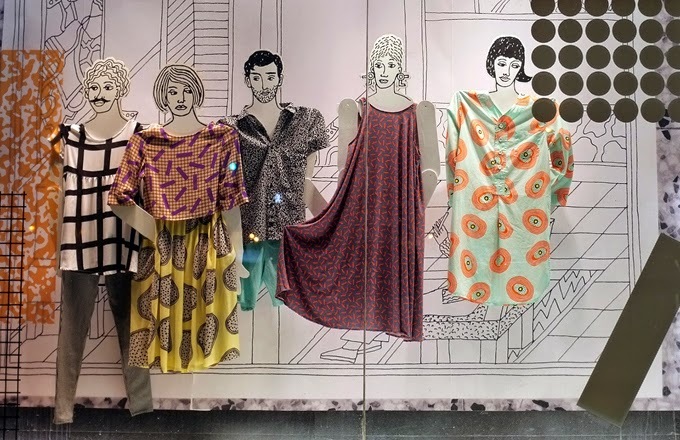 The African tribal print was the starring role of the collection as it was for the Nathalie du Pasquier's designs who recently has collaborated as well with American Apparel fashion brand. Everything looks like the influence of this eighties cultural movement has come back to stay and we suspect that the next step will be taken by Chanel through his head designer and creative Karl Lagerfeld.